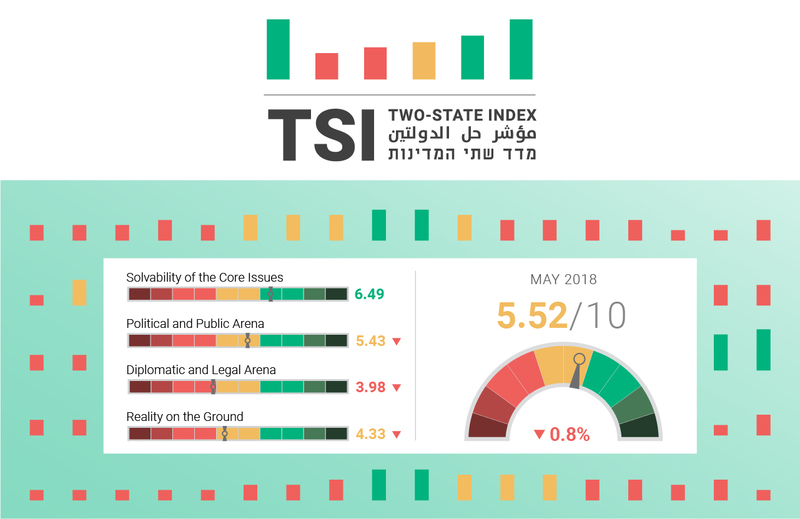 Settlement construction, Gaza escalation, the U.S. embassy move to Jerusalem, Abbas’s faltering health, EU action, and more: Here is why our Two-State Index (TSI) went down 0.8 percent in May. To learn about the TSI, read our introductory newsletter and visit our methodology page. Escalation in Gaza is at play. On May 29, Israel and Palestinian factions exchanged fire. The motivation for this round of violence, the most severe since the 2014 war, appears to be retaliation for a May 27 incident in which the IDF killed three Islamic Jihad members. As of May 30, a tenuous ceasefire holds. Prior, protests at the Gaza boundary peaked on May 14-15, when Israeli forces killed more than 60 Palestinians. The peak of the Hamas-supported marches — which have taken place since March 30 under the slogan “Great March of Return” — was held on the day the United States moved its embassy to Jerusalem and on the eve of Nakba day. Several factors raise concern for further escalation. The intensity of the IDF response to the demonstrations and its pinpoint targeting of material — but not human — assets sets the newly-created parameters of IDF Military Actions (Gaza) and Palestinian Attacks (Gaza) at 4, reflecting escalation but not yet overall intensification of Gaza conflict. [Note: the paramters in this section use reverse sclaes: escalation merits a lower grade, reflecting conditions that pose strain on the two-state solution.] For now, it seems, both Israel and Hamas want to avoid a full-scale war, but their ability to contain incidents diminishes; the Prospects for War parameter is consequently adjusted from 5 to 4. Prior to the recent round, reports surfaced that Hamas and regional parties are working on parameters for a long term ceasefire between Hamas and Israel. Prospects for such a lasting ceasefire stay remote. Separately, an Israeli soldier died on May 26 from injuries sustained during a military raid in the West Bank, moving the Palestinian Attacks (West Bank) parameter from 6 to 5. 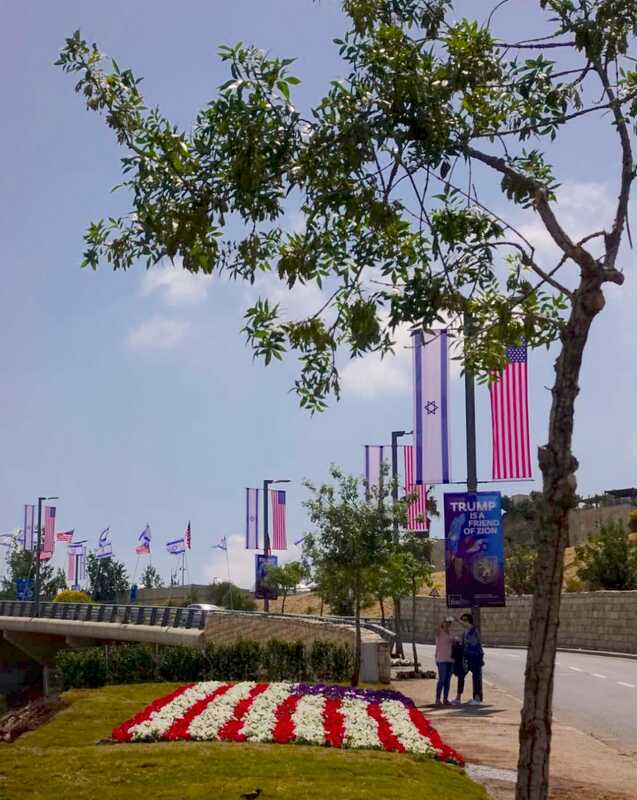 Israeli and American flags await the opening ceremony of the U.S. embassy in Jerusalem on May 14, 2018. Photo by Daniel Seidemann. The United States moved its embassy in Israel from Tel Aviv to Jerusalem on May 14. Guatemala and Paraguay followed suit. Most Israelis welcomed the American move, but the Palestinians rejected it and recalled their chief representative in Washington. The location of the embassy does not prevent the emergence of two capitals in Jerusalem since it is located on the western, Israeli side of any reasonable border proposal (including the borders proposed by the Geneva Initiative). This, of course, does not mitigate the harsh political consequences: the move worsened an already festering diplomatic rift between America and the Palestinians. Consequently, the United States parameter score moves from 3 to 2. Israel’s Higher Planning Committee promoted on May 30 plans for 1,958 housing units in Israeli settlements. An analysis by Peace Now's settlement watch project shows that 78 percent of the plans are located east of a potential border route as stipulated by the Geneva Initiative; at least 76 percent expand the existing footprint of the settlements' built-up areas; and the approval included the creation of two new settlements. A day later, 1,162 housing unites tenders were published. Should the plans turn into actual construction, they will add to the cost of an agreement, assuming it involves evacuation of settlers. The announcement further discredits a prospective peace plan. For its part, the Israeli public perceives it as a clear direction by its government: deeper into the West Bank and away from two states. The Israeli Public parameter is therefore adjusted from 6 to 5. According to Peace Now, since President Trump took office some 13,987 settlement units have been approved (in plans and tenders, including today's announcement, but not including East Jerusalem). This number is more than three times the amount that was approved in 18 months leading to his inauguration (4,476 units). The Palestinian Authority called on the International Criminal Court to open an investigation into alleged Israeli war crimes, crimes against humanity, and apartheid. The request comes as the ICC has already begun preliminary investigations of the 2014 Gaza conflict and Israel’s settlement policy. The referral could accelerate an ICC process that could ultimately lead to the indictment of high-ranking Israelis. Consequently, the Legal Institutions and Proceedings (Lawfare) parameter is updated from a troubled 3 to an alarming 2. Also last week, the PLO acceded to three U.N. organizations: the Conference on Trade and Development, the Industrial Development Organization, and the Convention on the Prohibition, Stockpiling and Use of Chemical Weapons. Transatlantic rifts were on full display, including over the issue of Israel-Palestine. 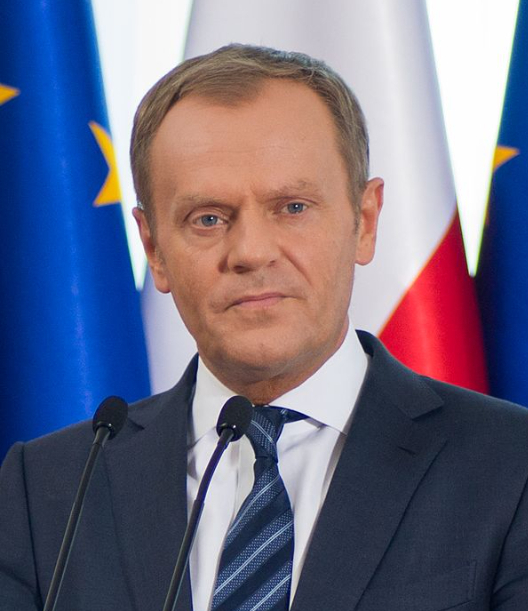 European officials — including European Council President Donald Tusk and European Commission First Vice-President Frans Timmermans — criticized America’s agenda. Separately, a joint EU statement criticizing the U.S. embassy relocation was blocked, but most European ambassadors shunned the Israeli reception marking the occasion. Finally, the European Union called for an investigation into the injury to Jafar Farah, director of the Mossawa NGO, during a demonstration. The EU response to America’s agenda on issues that directly relate to the two-state solution moves our Europe parameter from a generally-engaged 6 to a proactive 7. Gaza is a security threat to the residents of southern Israel because of the impact of the closure that has continued for more than a decade over Gaza's 2 million residents. As long as the closure continues, Gaza will not quiet down and rounds of fighting between the Israel Defense Forces and Hamas and the other Palestinian organizations will only become more frequent. Ever since the closure was imposed on Gaza in 2007, Hamas has spoken to Israel several times about coming to a long-term cease-fire agreement that would be based on removal of the closure in exchange for security quiet. Israel ignored the offers. Compared to 10 years ago, Israel finds itself in a much more complex security reality at present. Three large military operations in Gaza, in which thousands of Palestinians were killed, have not improved the situation. After the exchange of fire this week, the security Cabinet agreed to a cease-fire with Hamas because they realize that conquering Gaza to destroy the Hamas regime is simply not realistic. The truth is that Israel prefers the Hamas regime in the Gaza Strip as sovereign, over the other alternatives. The time has come for all the Cabinet ministers, headed by Netanyahu and Liberman, to admit that the closure policy over Gaza has failed miserably. They must admit that the military operations — even if they provided temporary periods of quiet to the residents of southern Israel — only intensified the problem over time and sent Israel into a pointless security spiral. Read Eldar's full analysis here.